Maximizing personal sovereignty and safety. At Casa, we are exploring the most extreme ways to protect our clients and their data. With that in mind, today we are introducing the Casa Faraday Bag to protect your hardware wallets. Casa Faraday Bag is a physical shield for your hardware wallets that is not only dust and water resistant, but also blocks electromagnetic radiation – Cellular, GPS, Bluetooth, Wifi, RFID, NFC radio waves and more. We teamed up with the pros at Silent Pocket, who make shielded bags for laptops and phones, to bring you this exclusive case designed specifically for hardware wallets. The bags are available only as part of a Casa Keymaster membership plan. More details on how to get your Casa Faraday Bag are below (including for our new Gold members and existing Node owners!). Being self-sovereign over your data and wealth has many benefits, but it also introduces new problems and responsibilities with managing keys. Hardware wallets like those from Trezor and Ledger are a great way to ease the burden, but we’ve noticed that people can be careless with physical protection of their devices. We’ve seen hardware wallets linked to millions of dollars sitting out unprotected on a desk, or even worse—being casually carried around in someone’s pocket! Hardware wallets are sensitive electronic devices subject to the same risks as other electronics, such as water and dust damage, accidental force damage, bit rot (the deterioration in performance and integrity of electronic components) and more. Hardware wallets, like most electronics, can also be damaged by electromagnetic radiation. Fortunately, a protection against this threat was found by Michael Faraday many years ago. Faraday cages are named after Michael Faraday, the English scientist who invented them back in 1836. He built the first Faraday cage by building a room coated in metal foil. Despite high-voltage discharges from generator onto the exterior of the room, he showed that there was no charge found inside the walls of the room. 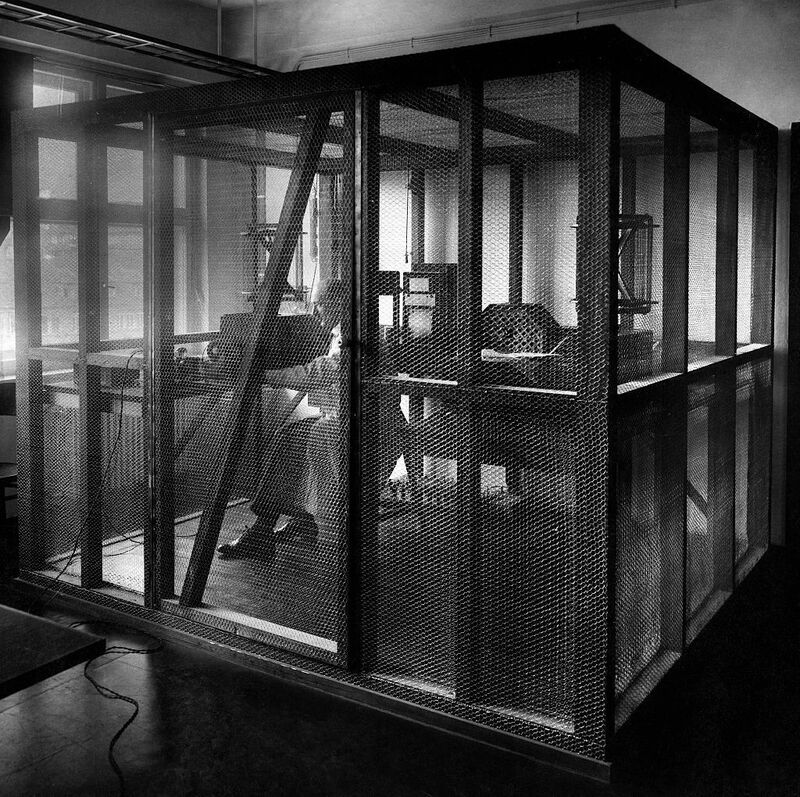 Early Faraday cage built in Germany, 1931. This same concept works with Faraday bags, which work by redistributing electric charges around the bag's exterior, canceling the electric field's effect on the interior of the bag (preventing gaps in your exterior with a foldover or roll closure on your Faraday bag is important for that reason). Faraday bags can protect devices that can be affected by radio: mobile phones, laptops, passports (all US passports issued after 2007 have an RFID chip embedded)—you name it. If you put a device into a Faraday bag, the device might still listen for incoming radio emissions, but none will reach it. Your device may also try to transmit and communicate externally, but its waves won't exit the bag. Most hardware wallets only power-on when connected to a computer. Most also do not emit radio waves. So why go to the extreme of using a full Faraday bag? Because hardware wallets are already becoming the most important and sensitive electronics that we use on a regular basis. The real world effects of exposure to various types of electromagnetic radiation on sensitive electronics are hard to predict. Blanket protection with a Faraday bag is an easy first step, but there’s still a lot of research to do. The extreme risk case for hardware wallet electronics is protection against an electromagnetic pulse (EMP), a strong wave of electromagnetic energy. EMPs are most commonly linked with nuclear weapons blasts or solar weather events like a coronal mass ejection. What many don’t know is that smaller EMPs can be triggered by lightning strikes or even power line surges. During our research, we also heard from friends in the defense industry that EMP guns now exist—with claims that a focused blast can disable any unshielded electronics in the vicinity. Using a Casa Faraday Bag will NOT fully protect your devices from an EMP blast, but we do believe it will increase your device's odds of survival over leaving it totally unshielded. This is an ongoing area of research. It will take years of study and experiments to arrive at the best possible protection for your hardware wallets and other signing devices. We will update our product recommendations to clients as we learn more. Ready to get a Casa Faraday Bag? Casa Faraday Bags are only available directly from Casa, as a part of our Gold, Platinum and Diamond sovereignty-as-a-service packages. All paid packages come with a Casa Node, full multisig with the Keymaster app on iOS and Android, hardware wallets and Casa Faraday Bags, and expert technical support. Not a member of Casa yet? Join Casa today to get the best personal sovereignty package available! Are you a Platinum or Diamond member? You should already have received your Casa Faraday Bags! Casa Faraday bags will begin shipping to you in the coming weeks. Did you buy a Casa Node within the last year? You get free Gold membership including a Casa Faraday Bag! More details on how to claim your Gold membership will be emailed to you soon, so keep an eye out. © 2019 Casa Blog. All Right Reserved. Published with Ghost. Casa Blog. Maximizing personal sovereignty and safety..